Despite temperatures in the high 90’s and extreme humidity volunteers from the Eastern Pennsylvania and New Jersey MDS Unit began a Partnership Housing Project (PHP) on June 30 and continued working on the home through one of the hottest weeks of the year. Read the full article printed on the MDS website HERE. Ambler Mennonite Church (AMC) sits on a beautiful, large corner lot in the borough of Ambler, Pennsylvania. 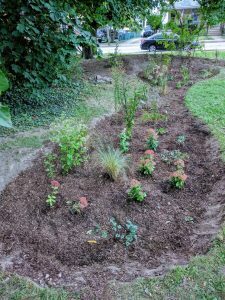 Environmental stewardship of that property is important to the congregation, and in September, we took a big step towards improving our green infrastructure with the installation of a large rain garden. Previously, storm water runoff from our parking lot and yard made its way to the lowest corner of the property, making it soggy, muddy, and generally unattractive. This runoff also contributed to downstream flooding of the Wissahickon Creek that occasionally caused flooding for our neighbors. 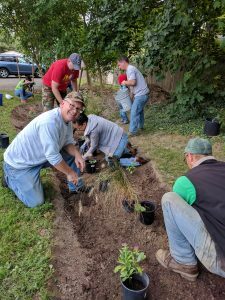 In an effort to be good neighbors and good stewards, AMC reached out to Ambler’s Environmental Advisory Council (EAC) for assistance and expertise, knowing that they had initiated the installation of dozens of rain gardens on private and public property throughout the borough. The EAC was excited to collaborate with us. They brought in Red Tail Land Restoration & Land Management to do the soil remediation and Tannery Run Brew Works to provide volunteer labor and financial support. We all saw the potential in this soggy corner for a garden that would filter pollutants, have better drainage, reduce downstream flooding of the Wissahickon Creek, and be a source of beauty and enjoyment for the congregation and the neighborhood. Due to the visibility of our property, the EAC also saw opportunities for using the garden to educate the community about storm water management, rain gardens, native plants, and environmental stewardship. AMC and community members dug deep (literally) in their own gardens to supply a variety of plants and shrubs. 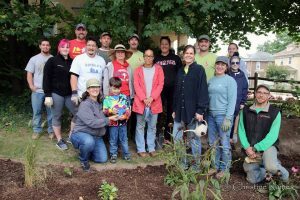 On a crisp fall morning in late September, dozens of church and community volunteers came together to plant the new rain garden. Local business donated coffee and pastries to keep the volunteers energized. Working all together was a tremendous blessing, as connections with neighbors and new friends were made. The end result is a beautiful space that arose from neighbors who care for each other and the environment.